In part one of this series we did a quick setup of the Gremlin server and put together a very simple blogging API that covered simple CRUD of blog posts. In part 2 we will go a little bit deeper with Gizmo covering some of its cooler features that will help you quickly and easily get data in and out of the graph. One of the things that we mentioned, but did not implement, are tags for the blog posts. We added a Tag vertex and a HasTag edge and both of their mappers, but there is no functionality in the API to take advantage of any of that. We'll add that now. Each Tag entity should be unique. We should not have multiple tag vertices with the same value, e.g. there should only be one Python tag. Having a single tag vertex would make walking the graph from that point pretty damn easy. A Post should only connect to a Tag once. This is crucial from not only a data integrity standpoint, but also helps to ensure proper management and reporting. Whatever list of tags that we provide will be the only tags associated with the Post -- PUT-based logic. Return a list of tags with each blog post from the API. We can accomplish these requirements pretty easily, we actually have the first requirement covered already. let's take a look at how our entities and mappers currently exist. That unique_fields property in the TagMapper is a list of fields that should be checked for uniqueness whenever a tag is saved. A very simple Get-or-Create. And if you had multiple values in the unique_fields property, Gizmo would just append more has('field', $ENTITY_FIELD_VALUE) checks onto the query. Groovy is pretty cool, and it is even cooler that the Guys and Gals over at Tinkerpop decided to use it as a means to traverse the graph. To fulfill this requirement we'll have to look at HasTag edge and create a new HasTagMapper. The unique property on the HasTagMapper is used to check for uniqueness on the out entity, in entity, and the label of the edge (since the label isn't explicitly defined on the HasTag object, Gizmo converts it to 'has_tag'). Here are are again with Gremlin/Groovy being a damn cool language and a great example that justifies Gizmo's decision to implement the Data Mapper pattern. The first two lines in this script simply sets variables for each entity involved to be used in the edge creation portion, this example assumes the vertices already have an id and are simple retrievals (if the entities did not exist, they would had been created here). Now we can take a look at the edge section of the script, the first part of this query simply checks to see if there is an edge in both directions with the label of 'has_tag' between our some_post and the python_tag vertices. The rest of the script will create and return the edge if it doesn't currently exist. To satisfy this requirement we can simply add a couple of methods to the PostMapper that will handle adding new tags and removing tags that were not specified. Typically I would put the get_tags and add_tags methods in a class called TagMixin and mix that into all of the mappers whose entities should have tags. This makes your code a bit more flexible by utilizing composition, but this post isn't about that. 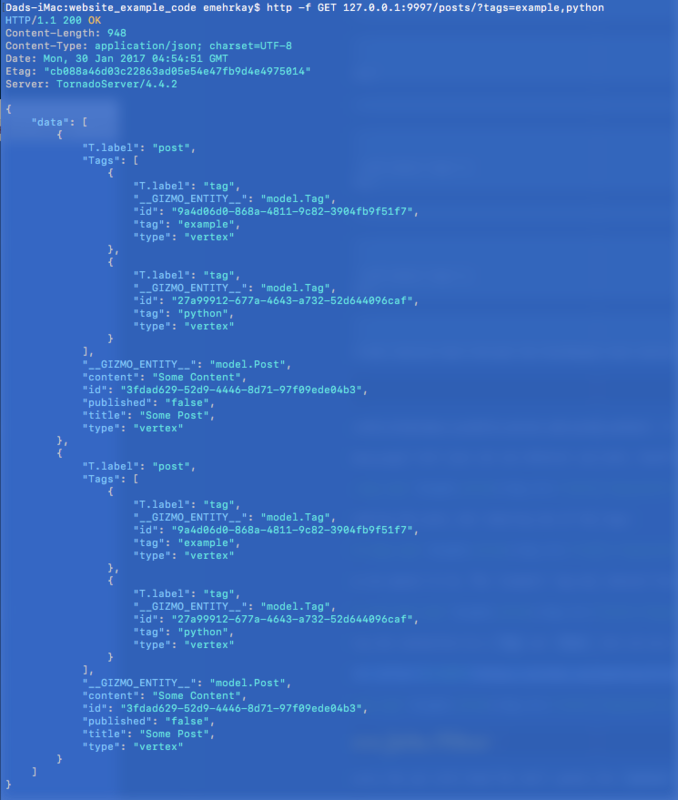 The get_tags method is pretty straight-forward; it gets the tags for the entity that was passed in. Things get interesting in the add_tags method. We first retrieve all of the existing tags and create a list of tag entities that no longer will be used for this entity and a list of newly added tags. The code loop through the new tags and adds them, notice here that we are executing the query after every iteration. This is done to ensure that we create a simple template on the Gremlin server that will allow for faster code execution with every subsequent request. Next we want to delete all of the edges between the Tag and the Post that were not passed in, but existed before. In this code we imported the GetEdge statement from gremlinpy.statement, statements are simple templates in that we can apply to our Gremlin scripts and this one simply gets the edge between two ids based on direction and label. Once we have the edge, we can delete it. Each mapper has a data method that is asynchronous and accepts either a single entity or a collection of entities. This allows us to add more data to the representation of the entity, to further map more data onto it. Let's add that to our PostMapper. Refer back to part 1, or the README in associated files for instructions on how to run the API server. I am using a little project that I wrote called GrimREPL. Yeah I know, it should be "Grem" like Gremlin. I messed up. I'm sorry, but still check it out. What is the point of tags if we cannot query the API with them? We shall update the /posts/ end point to listen for a comma separated list of tags passed in with a query string like: ?tags=python,example. We also need to add a new method to the PostMapper to retrieve posts by tag. Gizmo makes it pretty easy to add some business rules to your graph. I will write about Gizmo's other cool features that will allow you to fully expresses your business needs using Python against the Gremlin Server in the upcoming weeks. Have fun and if you have any questions hit me up on Twitter @emehrkay.